but I guess I should count myself lucky to have these two. One (Welt, or World) stamp came on a Postcrossing postcard and the other (Europa) came with several other stamps from another Austrian Postcrosser. The third (Inland) shows the flag filling in just the country of Austria in a small map of other unidentified neighbouring countries. I can't find a picture of it that I can borrow from the internet. 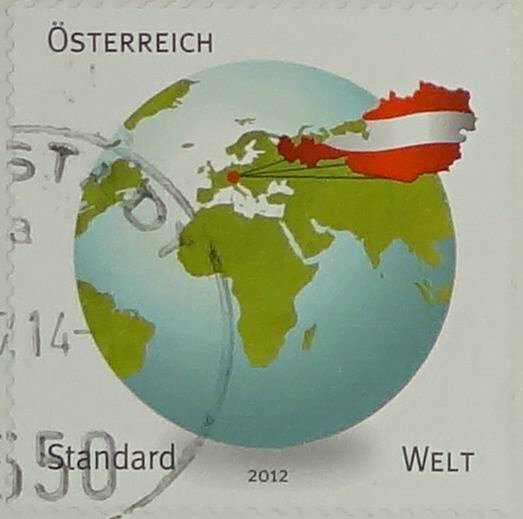 All of the stamp designs show the flag fluttering in the shape of the country. What a clever way for an inland country to show its map and location. These are great designs indeed. 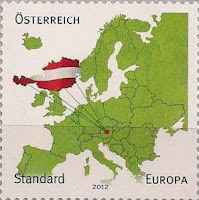 I agree, this is a clever and unusual way to represent a country on postage.